The Sand Dollar shopping center is on the west side of Third Street and is 1.7 miles south of Atlantic Blvd and .7 miles north of Beach Blvd, and 2.9 miles north of JTB. Click on the map below to get turn by turn directions or use the basic written directions below that. . If you have any questions, call 246-2206 for further information, or we can guide you in. Come south on I-95. Exit onto 295 eastbound (toward Blount Island). Exit onto Atlantic Blvd eastbound. Follow the directions below. . .
Go right (south) on Third Street (A1A). The studio is exactly 1.7 miles south of Atlantic Blvd on the right. It is in the Sand Dollar shopping center on the corner of 10th Avenue North and Third Street. This shopping center is home to Buddha's Belly, Jazzercise, Sprint, Fred Astaire Dance Studio, and more. 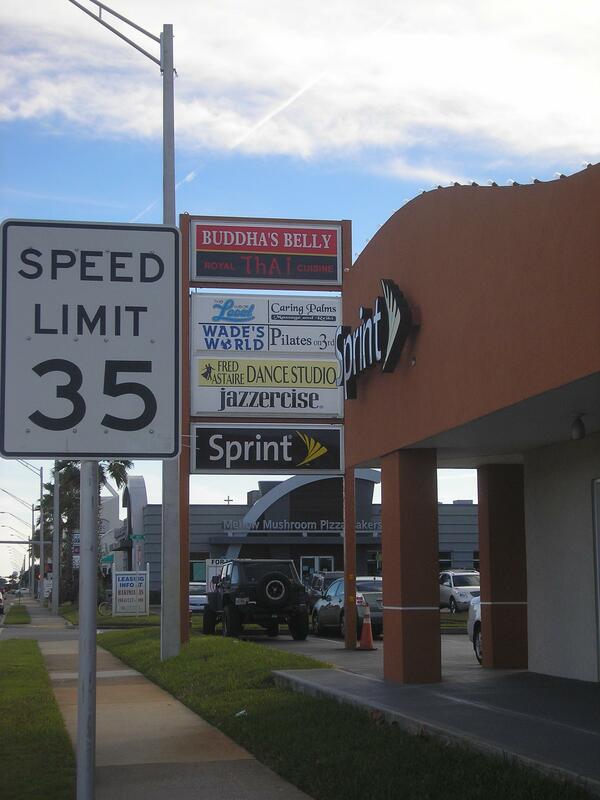 Caring Palms is located in the far corner between Jazzercise and Buddha's Belly. Below is the view of the sign with the Sprint store on the right and the Mellow Mushroom restaurant in the background. This is how it looks heading south on Third Street. Turn right onto 10th Avenue. Come north up I-95. Exit onto 295 eastbound. Exit onto Butler Blvd eastbound. Follow the directions below. . .
Go left (north) on Third Street (A1A). If coming from JTB, the studio is exactly2.9 miles away. Beach Blvd is 2.2 miles north of JTB. The shop is exactly .7miles north of Beach Blvd on the left. Look for the traffic light at 9th Avenue North. Go through that light (stop if its red), and make your first left onto 10th Avenue North. Caring Palms is in the corner between Buddha's Belly and Jazzercise. Below is the Sand Dollar plaza heading north on Third Street. Turn left just past the Mellow Mushroom restaurant onto 10th Avenue.